Update 5/9/2017: So I couldn’t get that poor paper out of my mind – the only one pubished in The Plant Cell prior to 2015 that, apparently, had received zero citations to date, and decided to double-check. Turns out the paper is listed incorrectly in the Web of Science (wrong first author), and this paper has, in fact, received nearly 60 citations to date according to Google Scholar! The four published in 2015 listed in WOS as having zero citations to date all have one or more citations listed in Google Scholar in peer-reviewed English language journals… most of those are very recent, so WOS is not quite as up-to-date as Google Scholar. This means that the number of research articles and reviews published in The Plant Cell from its inception in 1989 through 2015 that have received zero citations to date is not “close to zero”: it is ZERO. We all know that, on average, papers published in THE PLANT CELL are highly cited. But did you ever wonder how many papers published in the journal never get cited? After seeing some recent tweets with respect to “academic papers” and papers in the “natural sciences”, I decided to get the data on THE PLANT CELL. 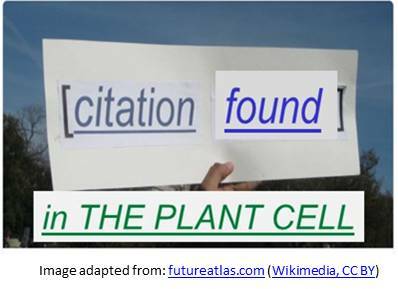 Of ~5700 primary research and review articles published in THE PLANT CELL from its inception in 1989 through 2015, a total of FIVE have received zero citations as of May 2017 (Web of Science data collected 5/8/2017). That is < 0.1 %. If we consider only more recent publications (not allowing citations to accumulate over many years), for example, just papers published in 2015 (the most recent calendar year for which all papers are at least 12 months past the publication date): THE PLANT CELL published 177 primary research and review articles in 2015, and as of May 2017, a total of FOUR have received zero citations – that is 2%. Still another way to look at the data would be to consider the most recent 2-yr “journal impact factor”, that is, citations in 2015 to papers published in 2013 and 2014. Out of 628 articles (primary research and review articles) published in 2013 and 2014, a total of EIGHT (1.3%) had zero citations in 2015 (and, incidentally, all eight have subsequently been cited). Or, maybe we should look at data for the soon-to-be released 2-yr impact factor for citations in 2016 to papers published in 2014 and 2015: out of 526 articles, a total of SEVEN (still 1.3%) saw zero citations in 2016. Long story short: submit your best work to THE PLANT CELL and get cited!